Sorry, An Antidote To Indifference. Issue 5 is out of stock. Some of the contents have been chosen specifically by other contributors. The rest just chose themselves really but please don’t forget this is just a small selection picked out from what really was a vintage year. 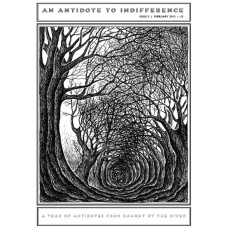 Front cover illustration by Stanley Donwood. Limited quantities available. This is a one off print-run, once it’s gone, it’s gone!